South Beach Residences VIP Preview soon! Register or Call +65-6367.0123 for exclusive appointment viewing now! South Beach Residences is part of the South Beach integrated development address within the historic Civic District in the heart of the city with myriad landmarks at the doorstep. 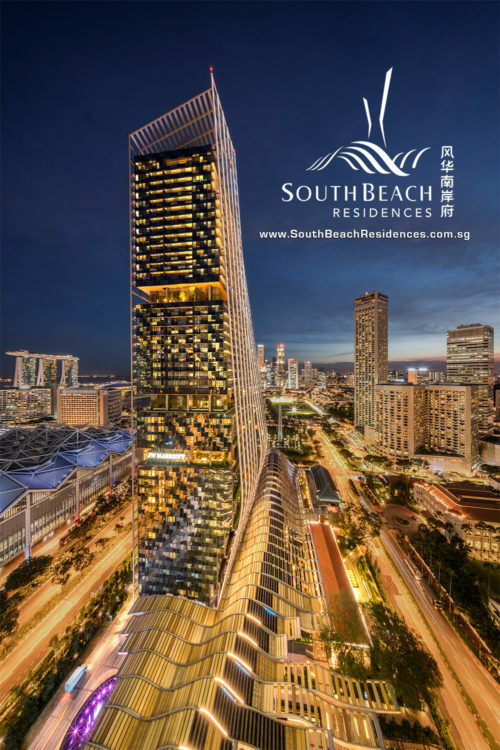 South Beach is a mega development consist of Ultra-luxurious 190 exclusive apartments ranging from two-, three- and four-bedroom suites to sprawling penthouses – South Beach Residences, JW Marriott Singapore South Beach, Grade A offices in South Beach Tower & Retail outlets. 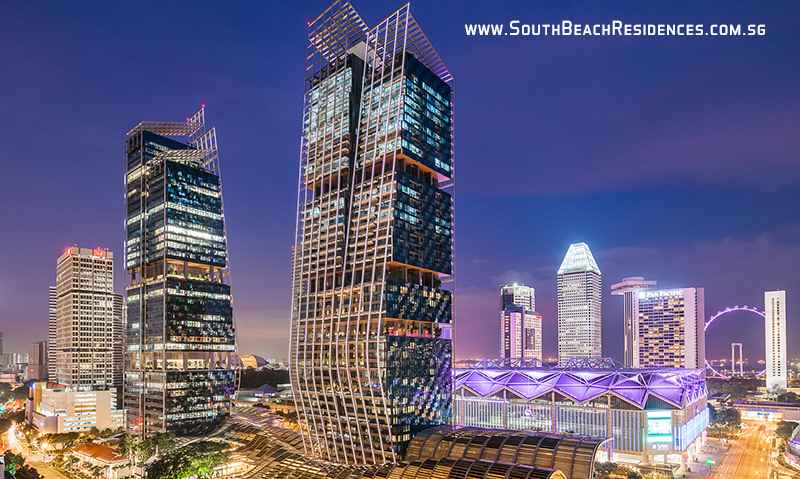 South Beach’s iconic architecture is designed with the idea of blending innovative form with environmentally sustainable design to create a distinctive, high-quality development that fits in well with Singapore’s tropical climate and urban context. One of South Beach’s stand-out eco features is the microclimatic canopy that runs the entire length of the development. The canopy which is engineered to harvest rainwater and fitted with photovoltaic cells to convert solar energy into electricity, serves an added purpose of providing pedestrians beneath it with a naturally ventilated shelter from the worst of the city’s tropical climate. Winner of two Green Mark Platinum Awards, the development’s green efforts are further supported by its good orientation, high performance glass façade and extensive sky gardens which help to absorb heat and maintain a high level of thermal comfort throughout the day. 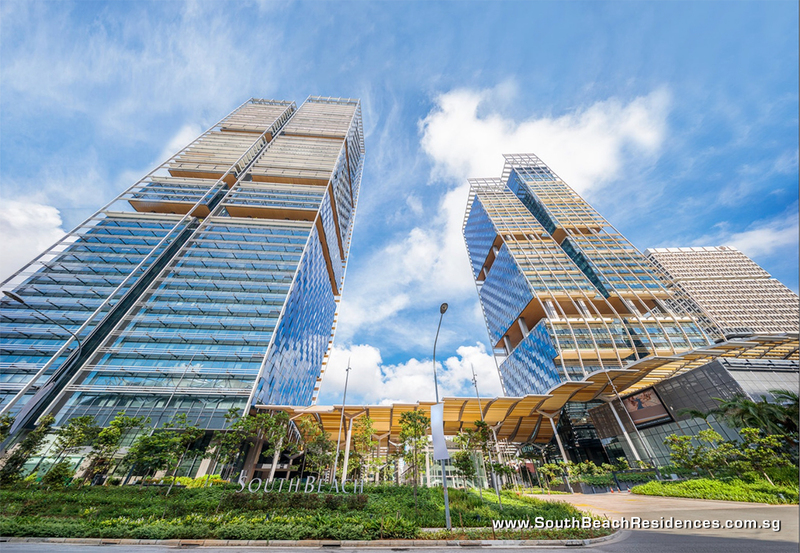 In addition, energy and water efficient fittings and certified green label building materials all contribute to South Beach’s commitment to being one of Singapore’s greenest developments. Representing the ultimate in luxury living, South Beach Residences offers a lifestyle experience that is peerless. Floor-to-ceiling windows and panoramic balconies that open up to the city skyline, revel in a luxury of space that is rarely found in the city. To own a rare exclusive 190 units apartment in South Beach Residences, Register NOW. © Copyright, South Beach Residences. All rights reserved.